We’ve got some products that are discontinued, slightly damaged or we’re closing out. All quantities are limited and products are on first come, first-serve basis. All sales final. So hurry!!!! BULK DRY PIGMENTS – Our bulk Pigments (also known as fresco powders) have a variety of uses in finishing. They are extremely fine and disperse well in any medium. 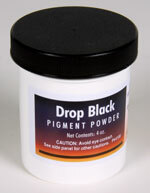 Can be added to varnish, lacquer, shellac and other finishes for tinting purposes. Use with heavy bodied glazing stain to make custom glazes to impart depth and richness to the finish. May also be added to glues for repair work as well as to color paste-wood fillers and waxes. The use of pigments allows the finisher the versatility of matching any color or modifying stock colors for custom color matching. Pigments are sold by volume, not weight. Available in 2 oz. and 8 oz. sizes in a polyethylene jar. Bulk Product is raw material that has been used to make our products. The list below shows what we have to sell and is all usable product. Ciba® Orasol® Dyes are metal complex dyes used by many manufacturers to make NGR stains. They are very soluble in a wide variety of organic solvents including alcohols, ketones, esters and glycol ethers. Unlike many metal complex dyes, they are very bright and vivid. Minimum quantity for order of bulk product is 1 lb.